What would you say to your friend if he told you he was going to drop his career in finance to play violin in Europe? Sounds like either insanity or bravery. Maybe a bit of both. Most great stories begin with a leap of faith. For Bennet Cerven, it was a simple matter of following his inner drive to spread his love of music. A few years later, and he is touring across Europe with his bandmates Florian Eisenschmidt and Oliver Maguire. Together, they form The Trouble Notes. Their music is recognizable: A lively violin at the forefront while percussion and guitar build the backbone of sound and rhythm. It is simple, authentic and utterly captivating. Cerven was born in Chicago in 1988. Both his parents are lawyers and wanted to give him the best education possible; learning an instrument was just one of the pieces of the puzzle. “My mother’s dream was to make us well rounded scholars, so when I was four, she came and told me to choose an instrument,” Cerven said. “I couldn’t tell you why, but I chose the violin.” He continued to play for most of his youth. At 15, he was part of an orchestra and was taking part in competitions across the country. The problem was, the classical method and training didn’t appeal to him. By the time he was 18, music had taken a backseat to his studies. Cerven then started university at Seton Hall in international relations and economics, which he completed in three and half years at the top of his class. With a degree in hand, he quickly found a job in a Wall Street hedge fund in investor relations. He swiftly moved up the ranks and got a few promotions. “I was working 100 plus hours a week. For my age, things were really moving,” he said. New York had not only provided Cerven with a career, it also allowed him to reconnect with his music. He happened to meet other musicians who were creating a band and looking for a violinist. This was his point of entry into the New York music scene. Despite his hectic work schedule, music kept calling. “At first, it was a bit of an escape, something that I would do to get me away from the stress,” Cerven said. Music gradually took up more and more space in his life. He began to play in the streets, write his own music and steadily hone his skills. “If you can work on the streets of New York, you can work anywhere. There, you’re lucky to get five seconds of anyone’s time,” he said. After about two years at the Wall Street firm, the musician decided to quit his job to travel through Europe. “I wanted to travel, write music and connect to cultures,” he said. “I wanted to experience music in a different way.” This change of air turned out to be a permanent one. A few years later, while they were traveling in Berlin, they met Eisenschmidt. Together, they form The Trouble Notes. 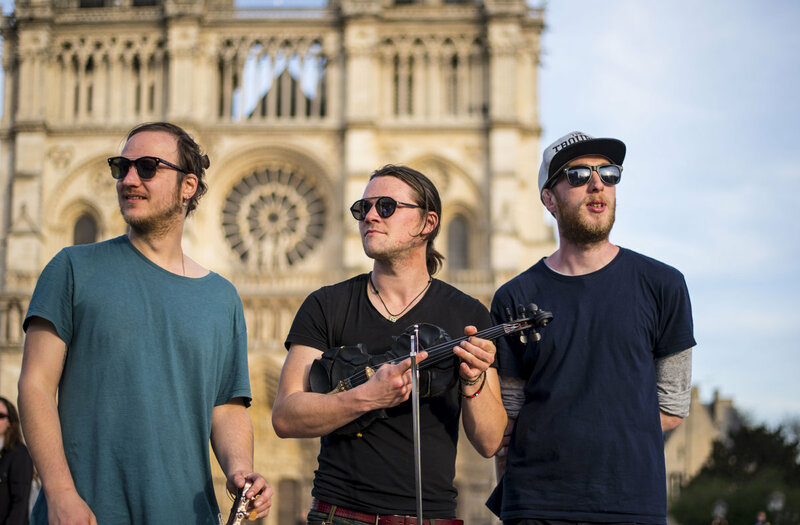 The band is made of three instruments: Cerven on the violin, Maguire on percussion and Eisenschmidt on the guitar. Describing The Trouble Notes’s sound can be quite tricky. One thing you can hear, though, is the influence from a variety of cultures and genres ranging from folk to middle-eastern rhythms. “I like to think about our music as a bridge between traditions and cultures,” Cerven said. By drawing inspiration from cultures and countries from all over the world, they help expose people to things they would not see on their own. The music The Trouble Notes make is centred on the rhythm. Its organic feel comes from the fact that a lot of their music is written in the streets and is inspired by their own experiences. The grand idea starts in their minds, is fueled by their daily experiences and shaped as they play in the streets. Every track tells a story, and every story has a message. Their latest album, Lose Your Ties—a nod to Cerven dropping the Wall Street tie—is available on Spotify.